I’ve determined there are two constants in my life: irony and entropy. I’ve gone back and forth about writing and publishing this blog. Living in the digital age in an industry that demands perfection, it’s a bit daunting to admit when things aren’t going as planned. Because everyone sees it. Instantly. Not that everyone cares, but we all like to project the rosy persona of poise and perfection. So I got this new horse. This very expensive, experienced, perfect-on-paper, “Unicorn” of a horse that some really fantastic people came together to help me buy. And he’s lovely. But—and there’s always a but—if I’ve learned anything about horses, it’s that they’re the worst at doing what you’d expect them to do. A few red flags popped up soon after the horse arrived. I contacted the agent and got the typical response of: “The horse is perfect! You must learn to ride it.” Which I don’t disagree with, entirely. So I spent a few more weeks learning to ride the horse and things still weren’t jiving. The horse was nervous, frightened and fearful of situations that, based on his resume, should not have been intimidating. And I started to feel the pressure—why wouldn’t this “perfect” creature go well for me? I did all my research, right? I had him checked and rechecked by my vet to account for any physical discomfort. I am very fortunate to be sponsored by Antares Sellier, and they ensured that he had the best possible saddle fit. He was on Gastrogard. He got plenty of turn-out. He has a 12×15 giant broodmare stall. He is arguably one of the soundest, best looked after creatures on the planet. And yet, he wasn’t the same horse I tried in Germany. Expectations are the worst thing you can place on a horse. I expected this horse to be my ticket to the grand prix ring because of what he had done in Europe and the feeling I got when I tried him. I expected that because we had finally invested substantial dollars into an experienced animal, I would finally be able to (with hard work and discipline) call myself a grand prix rider. To be clear, I did not expect this horse to cart me about a grand prix the minute his feet his American soil. But I did expect him to school reasonably at home and to jump 1.10-1.20-meter without any drama, two months after he arrived. Part of these expectations had to do with the experience I had in Europe. I downplayed my riding ability and experience when trying the horse. I told the agent and the trainer that I specifically needed a 1.40-meter seeing-eye dog and that above all I wanted something kind and brave to learn the upper levels on. I showed them videos of my current horse and explained how careful and sensitive she was and that I needed a horse I could make mistakes on. Again and again I was told that this horse was just that—that he would teach me. That was accurate. He would teach me. He continues to teach me. But for now, not about the upper levels. He teaches me every day about the importance of honestly representing sale horses. He teaches me about the dangers of moving a young horse up the levels too quickly. He teaches me about the futility of pride. And like all good horses, he teaches me patience, humility and compassion. Once I moved past the initial stages of grief and into acceptance, I realized two things: 1. Horses don’t read their own resumes. 2. They have no idea how much money you’ve put into them and they don’t care. People send me their “problem children” all the time. Retraining and trouble-shooting is a big part of what I do. If I took away all the other noise and just looked at him as a horse, not a unicorn, what would the next step in my training program be? So that’s what I did. I realized that he didn’t know how to just be a horse. Yes, the German system is very different from the American and I’m sure better qualified individuals could elaborate further on the topic, but the root of the issue is that I needed to become a little more German and he needed to become a little more American. I was walking with a friend one day in Gulfport and I realized that he didn’t know how to walk on a loose rein. He tossed his head and noodled around and legitimately could not walk in a straight line without contact in the bridle. He was insecure and nervous whenever I softened my contact or took the pressure off. If I went so far as to ask him to stand still on a loose rein, I could actually feel his heart pounding through the saddle and feel him tense his whole body. These aren’t problems that can be fixed overnight and they translated into all parts of riding this horse. It became clear to me that he did not trust his riders, he feared them. And that can work to a point, particularly when you’re a big, strong German man who can ride a 1.60-meter track in your sleep. I am not that person. I am American. I ride like an American. Don’t get me wrong. I firmly believe in learning to ride a horse the way it likes to be ridden. When I rode him in my best “German” style, I was more effective but the horse was tense, fearful and flat through his body. That didn’t serve me. His nervousness in the ring was a symptom of a greater lack of trust in his rider. I don’t want a horse who will go through the flags because he is terrified of what will happen to him if he doesn’t. No horse jumps well in those circumstances. I want my horses to confidently do their jobs, to relax and use their bodies to the best of their ability in the air and trust that I will never ask them to do something they can’t do. After some long talks with my trainer, good friends and my investors, I decided to start over. Maybe he will be a world-beater equitation horse, or children’s/adult jumper, or maybe even the unicorn I thought he was, but before he can be any of those things he needs to be a horse. He needs to learn that it’s OK to relax, that the jumps are the height they are and that won’t change when he leaves the ground, that even if he’s scared I’m not going to hurt him and he can trust me to help him through any situation. I’ve learned that if you ask a horse a question and they don’t answer it correctly, asking it the same way over and over again rarely, if ever, works. So I ask him different questions on a loose rein, on the trail, in the field. He’s a horse with an extensive show record who was befuddled about walking up a hill in an open field the first time. I ride him through creeks, across ditches and over logs in the woods. Always slowly, always methodically, always with lots of praise. He has to face his demons and do the things that scare him, but I’ve got all day. I want him to make the choice to step over that spooky log with a gentle squeeze and cluck, not because he’s afraid I’ll murder him if he doesn’t. This is the scenic route to the show ring. This is going to take a while. But I have to keep looking forward. Dwelling on the frustration of things not going as planned serves no one. So for now, I will be grateful for spring weather, endless ride out and the world’s fanciest trail horse. 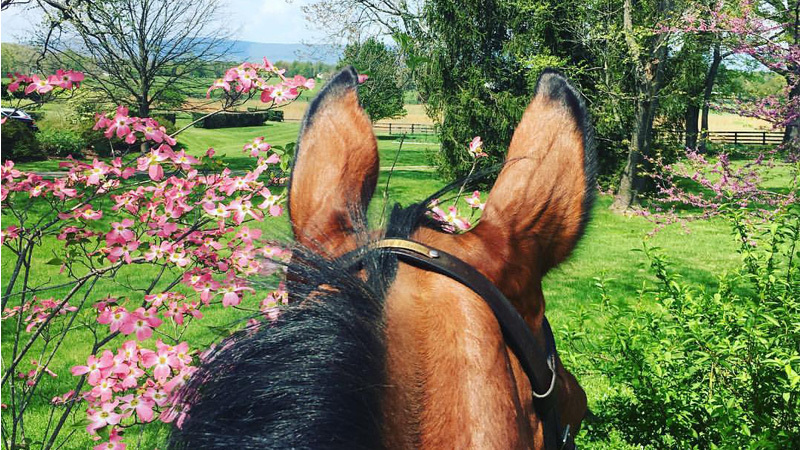 Chronicle blogger and up and coming hunter/jumper trainer Paige Cade spent most of the 2015 FTI Winter Equestrian Festival working for Margie Engle’s Gladewinds Farm, and in 2015 made the decision to return to Virginia to start her own riding and training business, Country Fox Farm, Inc. Paige would like to thank Antares, Equine Omega Complete, Dr. Sallie Hyman and Total Equine Veterinary Associates for their continued support for the 2016 season. Read all her blog entries.